A manuscript list of localities or countries in which Jews have been persecuted, together with the names of the martyrs, and necrologies. 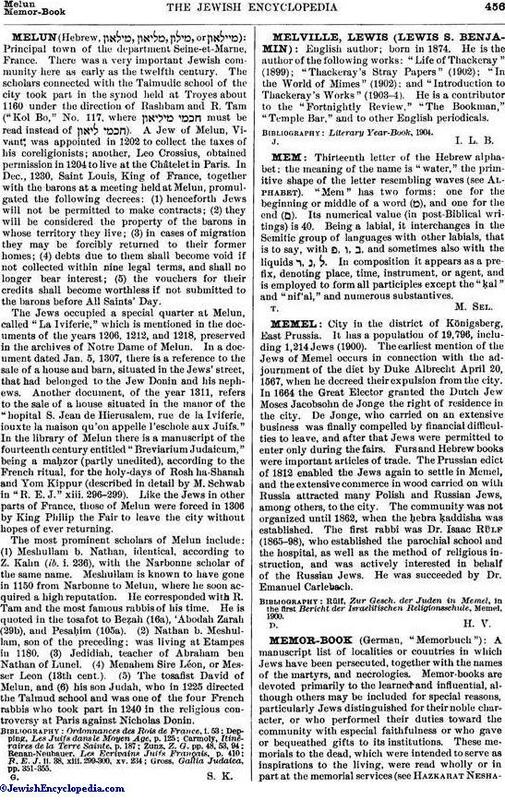 Memor-books are devoted primarily to the learned and influential, although others may be included for special reasons, particularly Jews distinguished for their noble character, or who performed their duties toward the community with especial faithfulness or who gave or bequeathed gifts to its institutions. These memorials to the dead, which were intended to serve as inspirations to the living, were read wholly or in part at the memorial services (see Hazkarat Neshamot).The so-called "memmern"—the reading of the lists of martyrs and of places of martyrdom—was heard in the synagogue on the Sabbath before the Ninth of Ab and on the Sabbath before Pentecost also. The earliest memor-book extant is that of the community of Nuremberg. It was begun in 1296, and is so complete that it must have had predecessors which served as models for it. At all events, notwithstanding their name, the memor-books are not borrowed from the Christian Church, but are a product of Jewish piety; for it has always been customary in Israel to remember the dead, to pray and to present offerings for them, and to hand their names down to posterity. Indeed, the Christian Church adopted this custom, which developed into the ritual observance of All Souls' Day, from Judaism. Although the different memor-books occasionally show a resemblance to a certain form of literature produced by the Catholic Church—the diptychs borrowed from the Romans, the "libri vitæ" or "libri viventium" used until the Carolingian period, the later calendars, necrologies, and martyrologies—yet many passages in the Church Fathers indicate that the prayers for the dead were Jewish in origin, and date from the time of the Apostles, who were Jews (comp. Bautz, "Das Fegfeuer," p. 76, Mayence, 1883; Propst, "Liturgie der Ersten Drei Christlichen Jahrhunderte," pp. 304 et seq.). After it had become customary to remember scholars, martyrs, benefactors, and others in prayers on the Sabbath and on feast-days, the names of the dead were entered in special books, with the formulas for the "hazkarah" or the "hashkabah" (see Hazkarat Neshamot), generally beginning with the words: "Yizkor Elohim nishmat . . ." (May God remember the soul of . . .). These books contained, in addition to the general part—the introductory prayers and the names of the noble and beneficent—a simple list of the dead, with notes on their works and the sums spent for the repose of their souls. A list of localities and countries where persecutions had taken place either preceded the necrologies or was added to them. The original name of the memor-book was taken from the Bible, and it was called either "Sefer Zikkaron" (= "Book of Remembrance," after Mal. iii. 16) or "Sefer ha-Zikronot" (= "Book of Commemorations"). 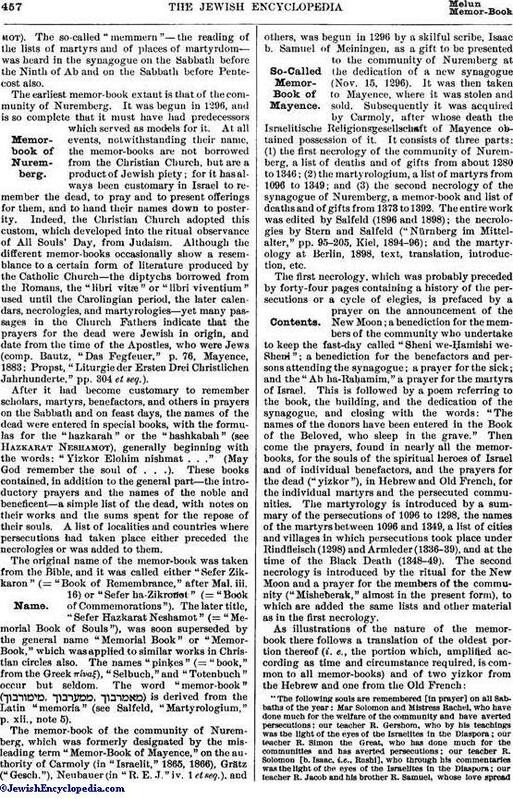 The later title, "Sefer Hazkarat Neshamot" (= "Memorial Book of Souls"), was soon superseded by the general name "Memorial Book" or "Memor-Book," which was applied to similar works in Christian circles also. The names "pinḳes" (= "book," from the Greek πίναξ), "Selbuch," and "Totenbuch" occur but seldom. The word "memor-book" ( ) is derived from the Latin "memoria" (see Salfeld, "Martyrologium," p. xii., note 5). 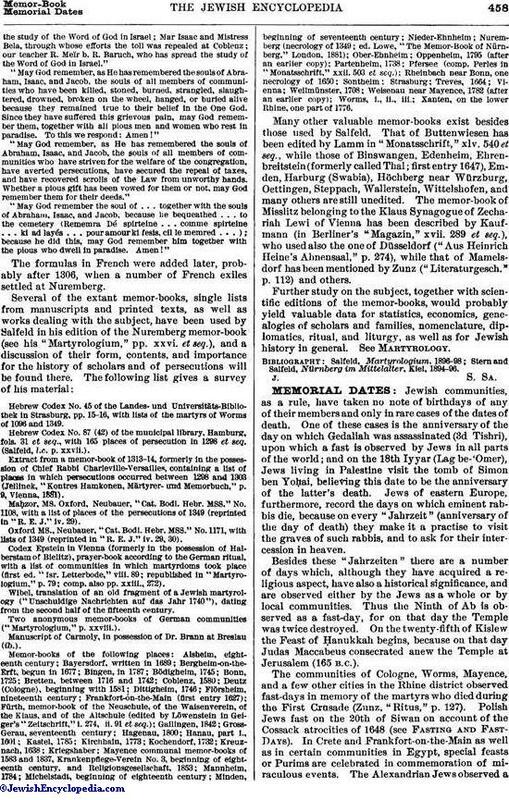 The memor-book of the community of Nuremberg, which was formerly designated by the misleading term "Memor-Book of Mayence," on the authority of Carmoly (in "Israelit," 1865, 1866), Grätz ("Gesch. "), Neubauer (in "R. E. J." iv. 1 et seq. ), and others, was begun in 1296 by a skilful scribe, Isaac b. Samuel of Meiningen, as a gift to be presented to the community of Nuremberg at the dedication of a new synagogue (Nov. 15, 1296). It was then taken to Mayence, where it was stolen and sold. Subsequently it was acquired by Carmoly, after whose death the Israelitische Religionsgesellschaft of Mayence obtained possession of it. It consists of three parts: (1) the first necrology of the community of Nuremberg, a list of deaths and of gifts from about 1280 to 1346; (2) the martyrologium, a list of martyrs from 1096 to 1349; and (3) the second necrology of the synagogue of Nuremberg, a memor-book and list of deaths and of gifts from 1373 to 1392. The entire work was edited by Salfeld (1896 and 1898); the necrologies by Stern and Salfeld ("Nürnberg im Mittelalter," pp. 95-205, Kiel, 1894-96); and the martyrology at Berlin, 1898, text, translation, introduction, etc. The first necrology, which was probably-preceded by forty-four pages containing a history of the persecutions or a cycle of elegies, is prefaced by a prayer on the announcement of the New Moon; a benediction for the members of the community who undertake to keep the fast-day called "Sheni we-Ḥamishi we-Sheni"; a benediction for the benefactors and persons attending the synagogue; a prayer for the sick; and the "Ab ha-Raḥamim," a prayer for the martyrs of Israel. This is followed by a poem referring to the book, the building, and the dedication of the synagogue, and closing with the words: "The names of the donors have been entered in the Book of the Beloved, who sleep in the grave." Then come the prayers, found in nearly all the memor-books, for the souls of the spiritual heroes of Israel and of individual benefactors, and the prayers for the dead ("yizkor"), in Hebrew and Old French, for the individual martyrs and the persecuted communities. The martyrology is introduced by a summary of the persecutions of 1096 to 1298, the names of the martyrs between 1096 and 1349, a list of cities and villages in which persecutions took place under Rindfleisch (1298) and Armleder (1336-39), and at the time of the Black Death (1348-49). The second necrology is introduced by the ritual for the New Moon and a prayer for the members of the community ("Misheberak," almost in the present form), to which are added the same lists and other material as in the first necrology. "The following souls are remembered [in prayer] on all Sabbaths of the year: Mar Solomon and Mistress Rachel, who have done much for the welfare of the community and have averted persecutions; our teacher R. Gershom, who by his teachings was the light of the eyes of the Israelites in the Diaspora; our teacher R. Simon the Great, who has done much for the communities and has averted persecutions; our teacher R. Solomon [b. Isaac, i.e., Rashi], who through his commentaries was the light of the eyes of the Israelites in the Diaspora; our teacher R. Jacob and his brother R. Samuel, whose love spreadthe study of the Word of God in Israel; Mar Isaac and Mistress Bela, through whose efforts the toll was repealed at Coblenz; our teacher R. Meïr b. R. Baruch, who has spread the study of the Word of God in Israel." "May God remember, as He has remembered the souls of Abraham, Isaac, and Jacob, the souls of all members of communities who have been killed, stoned, burned, strangled, slaughtered, drowned, broken on the wheel, hanged, or buried alive because they remained true to their belief in the One God. Since they have suffered this grievous pain, may God remember them, together with all pious men and women who rest in paradise. To this we respond: Amen!" "May God remember, as He has remembered the souls of Abraham, Isaac, and Jacob, the souls of all members of communities who have striven for the welfare of the congregation, have averted persecutions, have secured the repeal of taxes, and have recovered scrolls of the Law from unworthy hands. Whether a pious gift has been vowed for them or not, may God remember them for their deeds." "May God remember the soul of . . . together with the souls of Abraham, Isaac, and Jacob, because he bequeathed . . . to the cemetery (Rememra Dé spirteine . . . comme spirteine . . . ki ad layés . . . pour amour ki fesis, cil le memred . . .); because he did this, may God remember him together with the pious who dwell in paradise. Amen!" The formulas in French were added later, probably after 1306, when a number of French exiles settled at Nuremberg. Hebrew Codex No. 45 of the Landes- und Universitäts-Bibliothek in Strasburg, pp. 15-16, with lists of the martyrs of Worms of 1096 and 1349. Hebrew Codex No. 87 (42) of the municipal library, Hamburg, fols. 31 et seq., with 165 places of persecution in 1298 et seq. (Salfeld, l.c. p. xxvii.). Extract from a memor-book of 1313-14, formerly in the possession of Chief Rabbi Charleville-Versailles, containing a list of places in which persecutions occurred between 1298 and 1303 (Jellinek, "Kontres Hamkonen, Märtyrer- und Memorbuch," p. 9, Vienna, 1881). Maḥzor, MS. Oxford, Neubauer, "Cat. Bodl. Hebr. MSS." No. 1108, with a list of places of the persecutions of 1349 (reprinted in "R. E. J." iv. 29). Oxford MS., Neubauer, "Cat. Bodl. Hebr. MSS." No. 1171, with lists of 1349 (reprinted in "R. E. J." iv. 29, 30). Codex Epstein in Vienna (formerly in the possession of Halberstam of Bielitz), prayer-book according to the German ritual, with a list of communities in which martyrdoms took place (first ed. "Isr. Letterbode," viii. 89; republished in "Martyrologium," p. 79; comp. also pp. xxiii., 272). Wibel, translation of an old fragment of a Jewish martyrology ("Unschuldige Nachrichten auf das Jahr 1740"), dating from the second half of the fifteenth century. Two anonymous memor-books of German communities ("Martyrologium," p. xxviii.). Manuscript of Carmoly, in possession of Dr. Brann at Breslau (ib.). Memor-books of the following places: Alsheim, eighteenth century; Bayersdorf, written in 1689; Bergheim-on-the-Erft, begun in 1677; Bingen, in 1787; Bödigheim, 1745; Bonn, 1725; Bretten, between 1716 and 1742; Coblenz, 1580; Deutz (Cologne), beginning with 1581; Dittigheim, 1746; Flörsheim, nineteenth century; Frankfort-on-the-Main (first entry 1627); Fürth, memor-book of the Neuschule, of the Waisenverein, of the Klaus, and of the Altschule (edited by Löwenstein in Geiger's "Zeitschrift," i. 274, ii. 91 et seq. ); Gailingen, 1842; Gross-Gerau, seventeenth century; Hagenau, 1800; Hanau, part i., 1601; Kastel, 1785; Kirchhain, 1773; Kochendorf, 1732; Kreuznach, 1638; Kriegshaber; Mayence communal memor-books of 1583 and 1837, Krankenpflege-Verein No. 3, beginning of eighteenth century, and Religionsgesellschaft, 1853; Mannheim, 1784; Michelstadt, beginning of eighteenth century; Minden, beginning of seventeenth century; Nieder-Ehnheim; Nuremberg (necrology of 1349; ed. Lowe, "The Memor-Book of Nürnberg," London, 1881); Ober-Ehnheim; Oppenheim, 1795 (after an earlier copy); Partenheim, 1738; Pfersee (comp. Perles in "Monatsschrift," xxii. 503 et seq. ); Rheinbach near Bonn, one necrology of 1650; Sontheim; Strasburg; Treves, 1664; Vienna; Weilmünster, 1708; Weisenau near Mayence, 1782 (after an earlier copy); Worms, i., ii., iii. ; Xanten, on the lower Rhine, one part of 1776. Many other valuable memor-books exist besides those used by Salfeld. That of Buttenwiesen has been edited by Lamm in "Monatsschrift," xlv. 540 et seq., while those of Binswangen, Edenheim, Ehrenbreitstein (formerly called Thal; first entry 1647), Emden, Harburg (Swabia), Höchberg near Würzburg, Oettingen, Steppach, Wallerstein, Wittelshofen, and many others are still unedited. The memor-book of Misslitz belonging to the Klaus Synagogue of Zechariah Lewi of Vienna has been described by Kaufmann (in Berliner's "Magazin," xvii. 289 et seq. ), who used also the one of Düsseldorf ("Aus Heinrich Heine's Ahnensaal," p. 274), while that of Mamelsdorf has been mentioned by Zunz ("Literaturgesch." p. 112) and others. Further study on the subject, together with scientific editions of the memor-books, would probably yield valuable data for statistics, economics, genealogies of scholars and families, nomenclature, diplomatics, ritual, and liturgy, as well as for Jewish history in general. See Martyrology. Stern and Salfeld, Nürnberg im Mittelalter, Kiel, 1894-96.